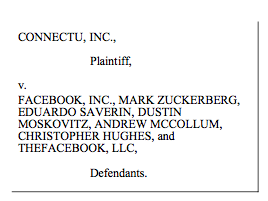 The Facebook/ConnectU litigation is moving ahead steadily – lawyers for both sides are in court today arguing over a preliminary motion to dismiss portions of the case. ConnectU has scheduled a press conference immediately following today’s hearing, roughly scheduled for 3 PM PST. We also expect some sort of statement from Facebook shortly. Stay tuned.